#1: Determine Ø(120) and Ø(225). 2)/2; hence a 6-pointed star cannot be drawn with 6 consecutive strokes. at our starting point too soon. and n – 1 as distances to travel, since they would be neighboring our initial point. have Ø(n) – 2 numbers with inverses that we can use to create stars from. using consecutive strokes without lifting the pen is (Ø(n) – 2)/2. #1: Use Euler’s Theorem to compute the following quantities. 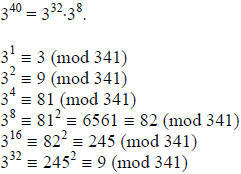 3340 ≡ 340 mod 341.
another congruence, namely 89 (mod 40). boils down to 78 mod 100.
n12 ≡ 1 (mod 72) for all (n, 72) = 1. Ø(9) = 6, so we have n4 ≡ 1 (mod 8) and n6 ≡ 1 (mod 9). observe that since n6 ≡ 1 (mod 9), then it follows that n6·2 = n12 ≡ 1 (mod 9). #Extra Credit: Let (m, n) = 1 and (a, mn) = 1. Show that . have that ≡ 1 (mod m) and ≡ 1 (mod n), since (a, m) = (a, n) = 1. Claim: and, by symmetry, . Likewise, we see that , proving the claim. #1: Find the four solutions of x4 ≡ 1 (mod 13). The text tells us that 1 and -1 (12) are solutions. There are still two more, though. (a) Show that xp-1 – 1 ≡ f(x) (mod p). = (-1)p-1(p – 1)! = (p – 1)! Also, (0)p-1 – 1 ≡ -1 (mod p). And so, f(0) ≡ -1 (mod p). f(i) ≡ 0 (mod p) since f(i) = (i – 1)(i – 2)…(i – i)…(i – (p – 1)) = 0. ≡ 0 (mod p) for 1 ≤ i ≤ p – 2.
equation and in the top equation, it will be equal to (p – 1)(p – 2)…1 = (p – 1)! Since p is an odd prime, by Wilson’s Theorem, we see that (p – 1)! ≡ -1 (mod p). Since p is odd, . we have shown that the two are equal.
. Recall from (b), we showed that ≡ 0 (mod p), i.e.